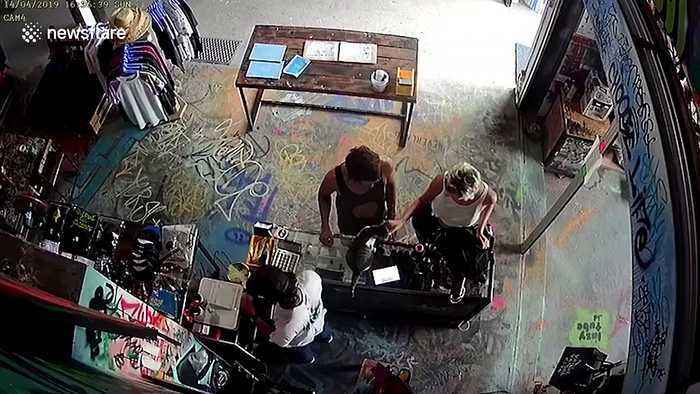 The blonde-haired woman and her partner asked to buy cans of spray paint form the clothing shop in Bali, Indonesia on April 14. While the assistant put the sale through the till, the woman innocently petted the kitten sitting on the counter. But while the worker’s back was turned she was seen scrambling to pick up a smartphone that he had left at the till - while glancing over at the shop assistant. The couple then walked out of the store but the man immediately realised his handset was missing and chased after them. CCTV shows how he confronted them and forced the woman to open her bag and hand back his phone. 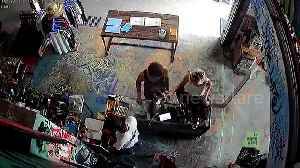 Julien Thorax, owner of the AllCapsStore, said: ''If you see these two people be careful. They tried to steal the phone of one of our employees in my wife’s store. ''Fortunately, he noticed it straight away and got it back. Also if you know where they live please let us know as we want to give the information to police.'' Julien said he had reported what he believes was the attempted theft to the local police in the Canggu district of the popular holiday destination. He added: ''I don’t want this to happen again to anybody else.